Download "Kaltura On-Prem Evaluation Package - Getting Started"
1 Kaltura On-Prem Evaluation Package - Getting Started Thank you for your interest in the Kaltura On-Prem Online Video Platform (OVP). Before you get started with your Kaltura On-Prem evaluation, a Kaltura sales representative will contact you to provide the following items: A temporary URL through which you can accept the evaluation agreement terms and download the Kaltura On-Prem evaluation package. A unique activation key for activating the OVP functionalities within your evaluation package for the duration of the evaluation period. 1. What is the Kaltura On-Prem Evaluation Package? The Kaltura On-Prem evaluation package is provided as a Linux VMware image, based on the CentOS 5.5 Linux distribution (32-bit) and pre-installed with the Kaltura On-Prem OVP software. 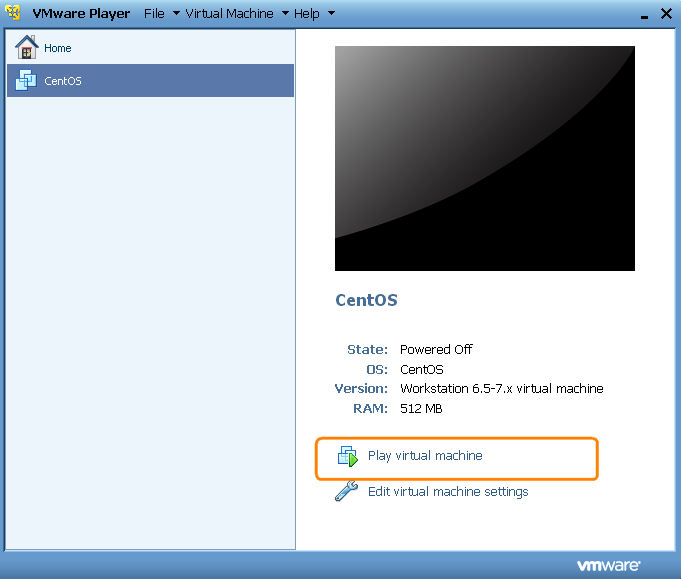 You can run this Linux VMware image on a PC desktop using a VMware player application, or on your virtualized server farm using the VMware ESXi server. 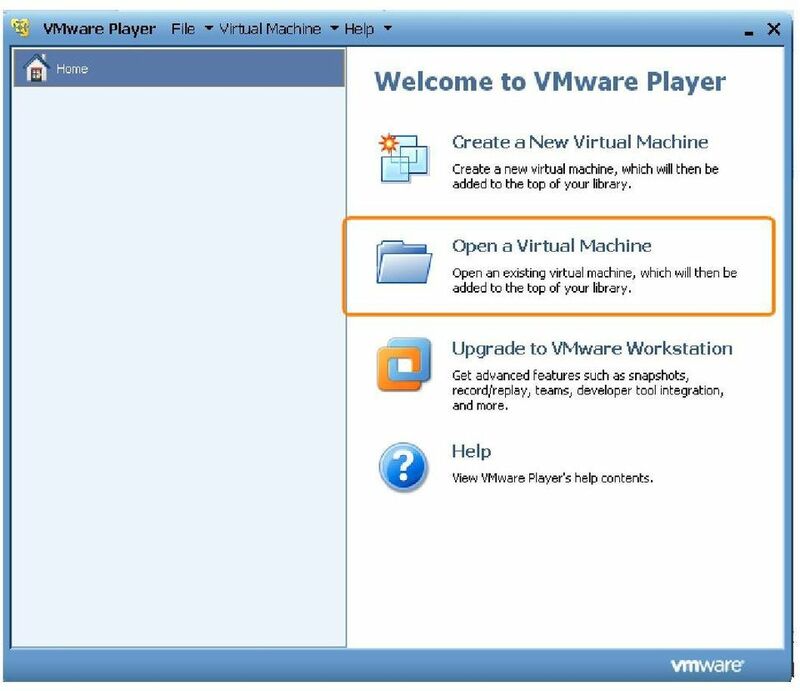 To enable the full functionality of the Kaltura On-Prem OVP, it is important that you host the VMware image on a desktop/server that will enable continuous use with no power shutdowns and no changes in network settings. 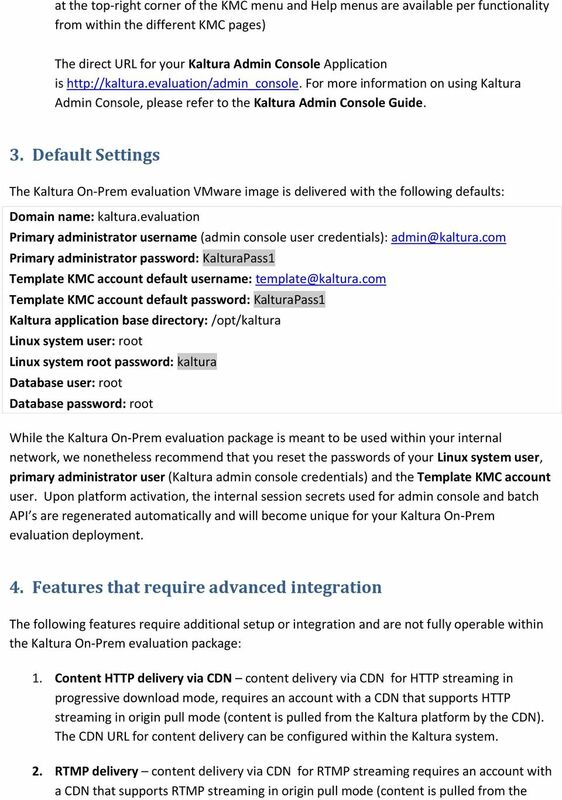 The Kaltura On-Prem evaluation package is delivered with Kaltura s defaults, and is meant for use within an internal network setup and not as a production platform. The Kaltura On-Prem evaluation package includes all the standard features of the Kaltura OVP (based on the Cassiopeia release of the Kaltura online video platform). Features that require additional setup, integration with CDN and/or 3 rd party components do not function within the evaluation package. For more information, please refer to the Features that require advanced integration section within this document. Usually, transitioning to a production setup will require the installation of a permanent instance of the Kaltura On-Prem video platform, where you can set your own site-specific values. 2. What is the purpose of the evaluation period? Kaltura is happy provide its On-Prem OVP evaluation package to potential customers who are planning to deploy their own OVP based on Kaltura s technology, so that they can gain hands-on experience with the platform and its capabilities. 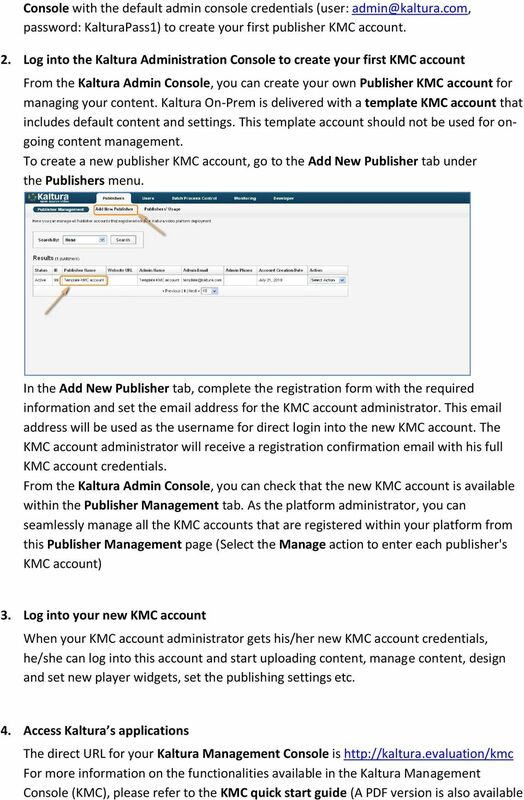 During the evaluation period you can learn how to administrate and extend Kaltura s On-Prem OVP: Gain experience working with the Kaltura Administration Console for on-going platform administration, and evaluate the code, APIs and internal configuration to better understand how you can extend Kaltura s On-Prem OVP for your own needs. Assess the level of work you may need for integrating it with your internal systems or with your CDN of choice. 4 3. 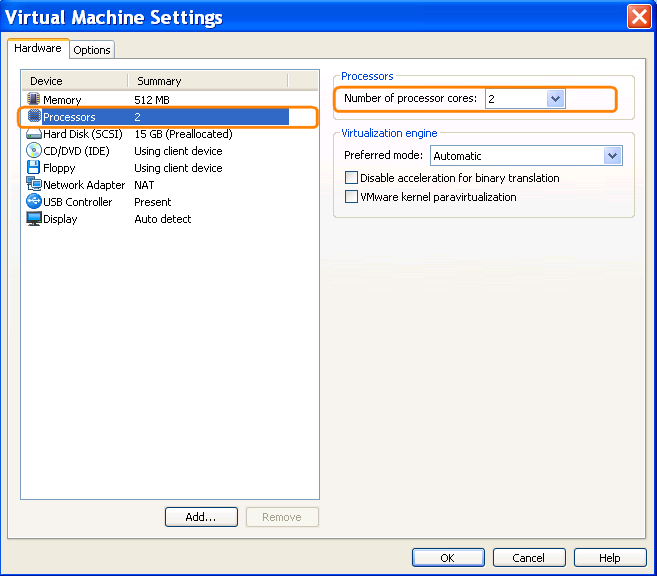 Adjust your virtual machine settings Note: If you are running the Kaltura On-Prem evaluation package on your personal desktop computer, you may want to consult your IT manager on the effect of the following settings. a. 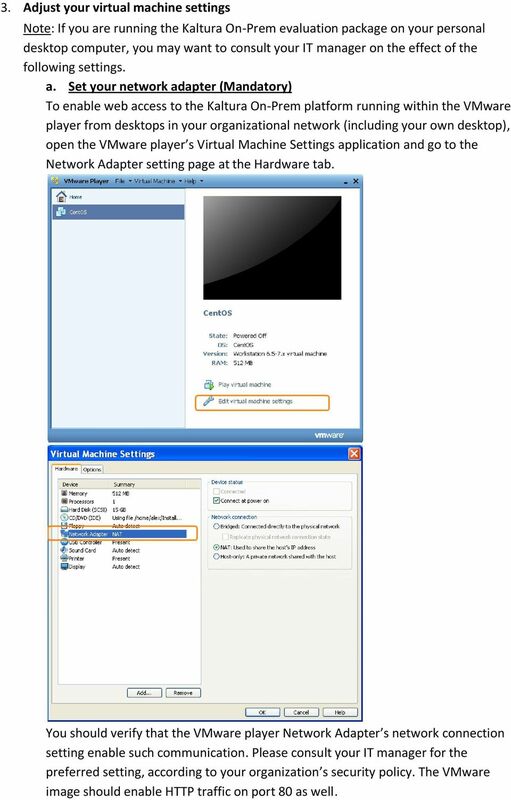 Set your network adapter (Mandatory) To enable web access to the Kaltura On-Prem platform running within the VMware player from desktops in your organizational network (including your own desktop), open the VMware player s Virtual Machine Settings application and go to the Network Adapter setting page at the Hardware tab. 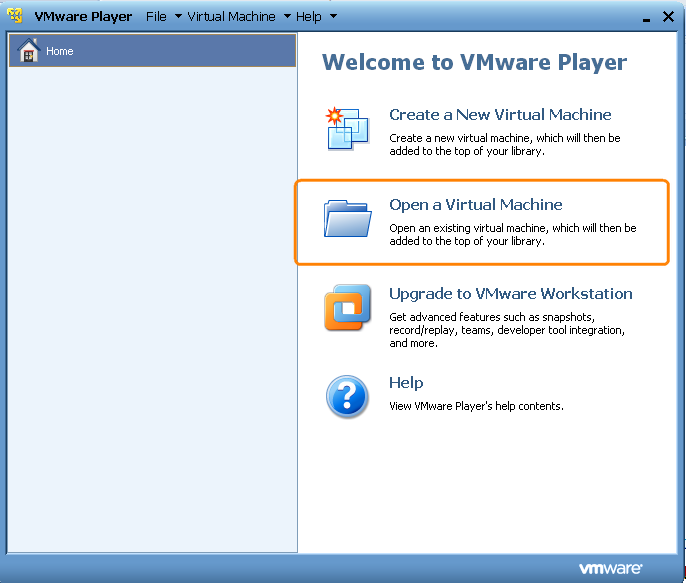 You should verify that the VMware player Network Adapter s network connection setting enable such communication. Please consult your IT manager for the preferred setting, according to your organization s security policy. The VMware image should enable HTTP traffic on port 80 as well. 5 b. Set your virtual machine memory (optional) To enable sufficient memory resources for your Kaltura On-Prem OVP, you may set a 1GB memory for your VMware machine c. Set the number of your virtual machine processors (optional) To enable sufficient processing resources for transcoding tasks within your Kaltura On-Prem OVP, you should enable 2 processor cores for your VMware machine. The On-Prem evaluation package is configured to support 2 simultaneous instances of transcoding tasks. 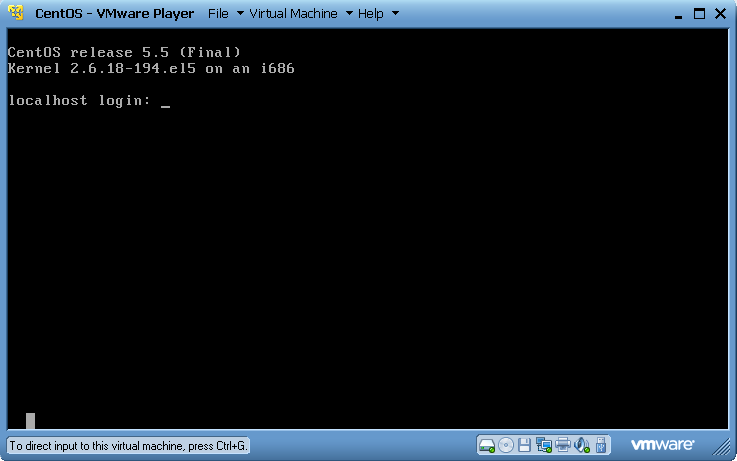 7 Your server will then initiate its services, until reaching the Linux command shell login. 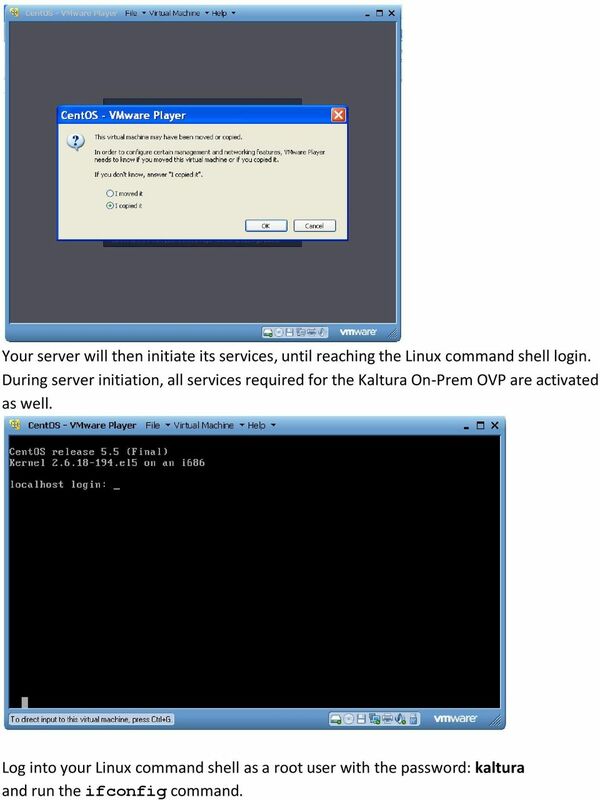 During server initiation, all services required for the Kaltura On-Prem OVP are activated as well. 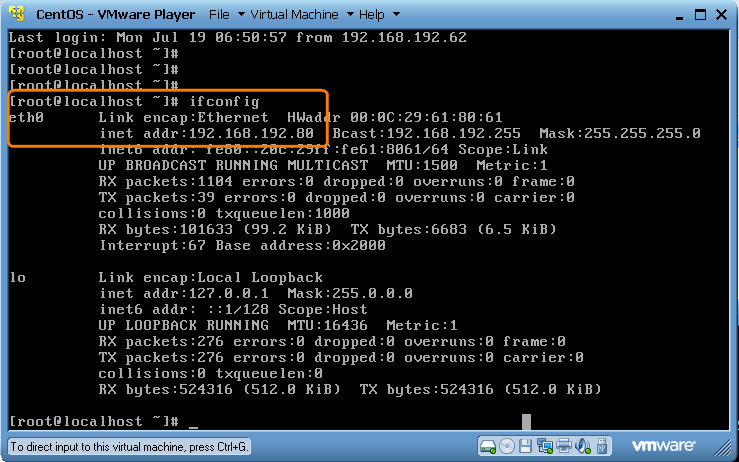 Log into your Linux command shell as a root user with the password: kaltura and run the ifconfig command. 12 Kaltura platform by the CDN in HTTP streaming mode and then served in RTMP). The CDN URL for RTMP content delivery can be configured within the Kaltura system. 3. Adaptive Bitrate - The Kaltura OVP is seamlessly integrated with Akamai for supporting adaptive bitrates. Integration with another CDN supporting this feature is possible considering it uses FMS Live streaming workflow provisioning of a live channel from within the KMC requires CDN integration. The Kaltura OVP is seamlessly integrated with Akamai for live streaming provisioning and workflow. Enabling your Akamai account for live streaming can be configured within the Kaltura system. Integration with a different CDN provider is also possible, but requires development. 5. Analytics CDN bandwidth usage with the standard evaluation package the bandwidth usage analytics includes streams delivered directly from your local Kaltura On-Prem server. When integrating with a CDN for content delivery, additional work is needed to include CDN delivery usage within the KMC graphs and publishers usage reports. 6. Analytics - User geo-distribution Requires license and integration with an IP to Geo mapping service. The Kaltura OVP is seamlessly integrated with the ip2location commercial database. 7. Access control profiles Geo restriction requires license and integration with an IP to Geo mapping service. The Kaltura OVP is seamlessly integrated with the ip2location commercial database. 8. Webcam recording requires integration with an FMS for recording webcam streams into the Kaltura platform. Your FMS can be configured within the Kaltura system to enable webcam recording functionality. 9. Transcoding to the VP6 Codec - requires additional setup of the On2 Flix Engine for Linux 10. Download of remix entries requires additional Windows based setup for remix flattening. If needed, this can be deployed by Kaltura as part of your production setup. 11. 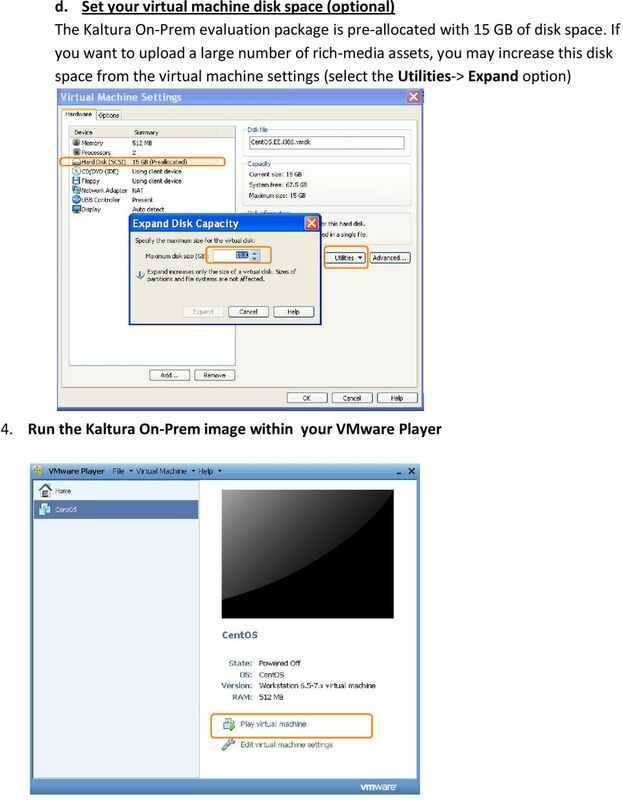 Integration of Kaltura s Video-Presentation widget - requires additional Windows based setup. If needed, this can be deployed by Kaltura as part of your production setup. 12. MS Silverlight - requires additional Windows based setup. If needed, this can be deployed by Kaltura as part of your production setup. 13 For further information regarding these features and the integration required to enable them, please contact your Kaltura Sales representative. 5. 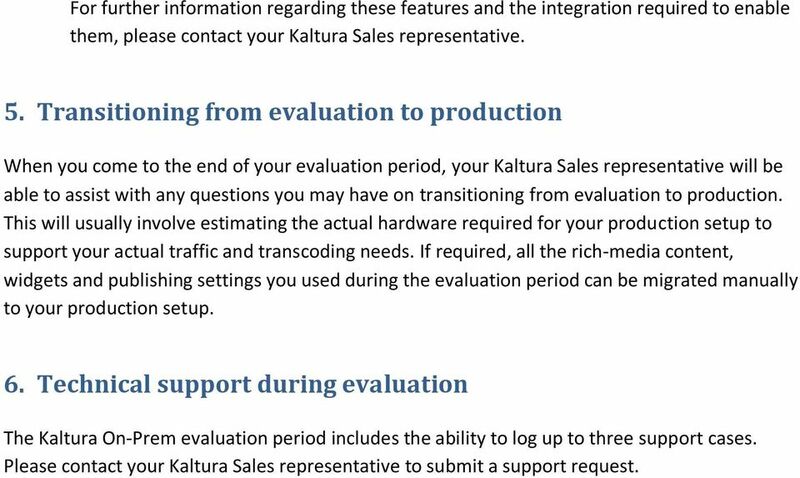 Transitioning from evaluation to production When you come to the end of your evaluation period, your Kaltura Sales representative will be able to assist with any questions you may have on transitioning from evaluation to production. This will usually involve estimating the actual hardware required for your production setup to support your actual traffic and transcoding needs. If required, all the rich-media content, widgets and publishing settings you used during the evaluation period can be migrated manually to your production setup. 6. Technical support during evaluation The Kaltura On-Prem evaluation period includes the ability to log up to three support cases. Please contact your Kaltura Sales representative to submit a support request. Kaltura Extension for SharePoint User Manual Version: Eagle Kaltura Business Headquarters 200 Park Avenue South, New York, NY. 10003, USA Tel. : +1 800 871 5224 Copyright 2012 Kaltura Inc. All Rights Reserved. 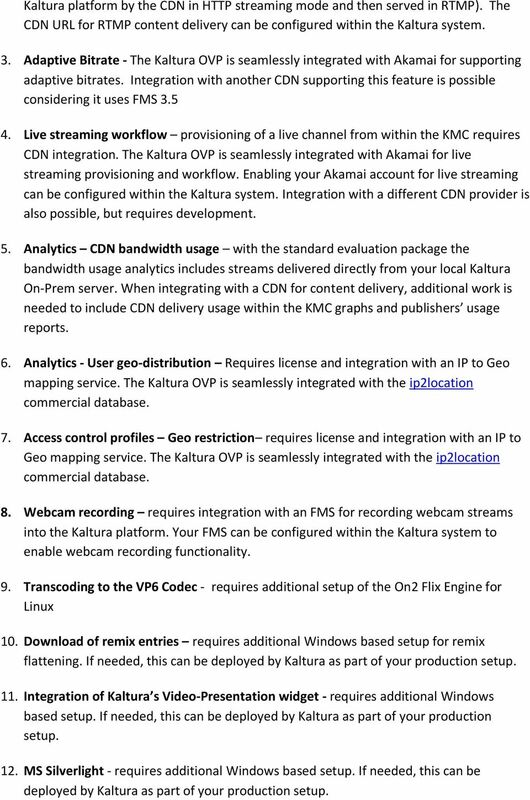 Kaltura Video Platform Architecture Overview Version: February 2013 Kaltura Business Headquarters 5 Union Square West, Suite 602, New York, NY, 10003, USA Tel. : +1 800 871 5224 Copyright 2013 Kaltura Inc.
Wowza Media Systems provides all the pieces in the streaming puzzle, from capture to delivery, taking the complexity out of streaming live events.